What began as a last minute effort to save a historic structure has resulted in the donation of a log cabin to be used as an information and exhibit pavilion for the T. Mabry Carlton II. Memorial Reserve. It takes many logs to make a cabin and it takes many people working together to achieve a goal. What is truly outstanding is how staff from throughout our business center and staff from other business centers worked as a team to turn an idea into a reality. Dave Baber of Historical Resources discovered that the owner of the cabin was seeking someone who would relocate and re-use the cabin. When Dave told Executive Director Walt Rothenbach about the cabin he met with an enthusiastic response. Managers Bob Conn, Jim King and Don Moultney were encouraged by the cabin's design, materials and condition. We believe that the cabin was constructed in the 1930's. The unique feature is the pine logs which exhibit scars from turpentine harvesting in the early part of this century. The logs came from the site and many standing trees with similar scars can be seen in the Pine Shores neighborhood where the cabin was located as well as at the Carlton Reserve. John McCarthy drafted a proposal for the use ofthe cabin which was accepted by the cabin owners, the family of William W. Merrill III. Rick Burton and Don Moultney assisted with the selection of the contractor, and Donna Johnson and Sue Torrington expedited the required purchase requisition. Administrative Services staff John Harrison and Jesse Mahoney ensured that no time was lost in getting the contractor on line. Joan Gaff and Jane O'Connor assisted with risk and liability issues, and Steve DeMarsh of the Office of the County Attorney provided prompt legal review. In order to assure correct reassembly, documentation was essential. George Tatge of Development Services volunteered a month's worth of weekends to document the original components of the structure, take hundreds of dimensions and assist with the drafting of as-built plans. John McCarthy took photographs and labeled each piece of wood in the cabin with aluminum tree tags provided by Richard Sanger of the Development Horticulture section. Sandy Burton prepared a board packet to seek Board of County Commission endorsement of the formal donation. The project contractor Pat Ball Construction Inc. was efficient and skillful. Pat Ball and office manager Brad Hindall coordinated the project. Project Manager Jeff Ball and Superintendent Jim Neuenschwander oversaw a well-tuned crew of carpenters. One day was spent removing the roof and roof framing. The next day the one-hundred log components were carefully disassembled. All cabin components were placed in an enclosed trailer and were transported to the Carlton Reserve by Scott Crofut of Fill Unlimited. Environmental Services staff Dave Cash and Steve Soltau arranged for a storage area for the trailer at the Carlton Reserve. The next step is to develop detailed structural drawings and seek permits for re-assembly. The Community Services Business Center thanks the Family of William W. Merrill III for the donation of the cabin. We are also thankful to the many people who contributed to the log cabin team. In September of 1999 Parks & Recreation became aware of the availability of a historic log cabin in need of relocation. An inspection of the cabin revealed design and materials to be of high quality and in good condition. A proposal was developed by Parks staff for the relocation and reuse of the cabin as a visitor's center and exhibit pavilion for the T. Mabry Carlton Jr. Memorial Reserve. Turpentine scars present on cabin logs link the cabin to the history of the proposed site. The Merrill Family's donation of the structure was accepted by the Sarasota Board of County Commissioners at their meeting of October, 12, 1999. Ball Construction Inc. developed a strategy for careful disassembly, transportation and storage. The structure was documented, disassembled and was transported in a covered trailer to the Carlton Reserve. Research into the history of the log cabin is ongoing. 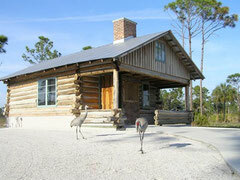 Log cabins are a rare architectural style in Sarasota County and this is one of a few known existing examples. The structure appears to have been built in the 1930's or 1940's. The logs are said to have been cut on site, and the presence of large numbers of turpentined trees in the nearby subdivision reinforces this oral history. Oral history records that in the late nineteen-twenties and early thirties the Longino family harvested turpentine from trees in the Pine Shores area. The base of the cabin floor is composed of fine beach shell that is either from the bay adjacent to the site or from nearby Siesta Key. A commercial shell pit was operated near Midnight Pass by the Guess family from the early 1930's to the mid-nineteen-fifties. This material was known for mineralizing into a hard surface. Pine lumber for framing and trim was rough cut on a circular mill. Reports of the structure dating to 1926 and 1905 have not been confirmed. An aerial photograph taken in 1948 reveals the cabin structure, and establishes 1948 as the latest possible year of construction. Structural components such as the wood casement windows are typical of the 1930's and 40's. Structural components noted during disassembly provide additional information useful in refining the likely span of construction dates. Comparison of growth rings from cabin logs with adjacent standing trees with turpentine scars may also refine the construction date. The first known log cabin in the area was built by William Whitaker and Hamlin Snell in 1843. This cabin was built along Sarasota Bay at Yellow Bluffs and was constructed of cedar logs cut from Longboat Key. This structure was burned by the Seminole Indians in 1856. Another log cabin was constructed at Shell Beach (New College Caples Campus) by W. H. English around the turn of the century. English was an agent for the Wallace Brothers Circus. This log cabin was purchased by Ralph Caples in 1909. Caples was a railroad man and is credited with encouraging John Ringling to visit Sarasota. The log cabin was replaced with a Mediterranean revival home in the 1920's. Four log cabins dating to the 1930's through 1940's have been identified. One is the subject structure at Pine Shores. Another is an existing single-family residence on Ringling Boulevard. Another is a cabin formerly located south of north creek and east of the Tamiami Trall in Osprey. A cabin very similar to the subject cabin is shown as a restaurant in an advertisement in a Sarasota Visitor's guide from 1948. This cabin was located on North lime Avenue, was known as the Dude Ranch, and featured meals and horseback riding. Features of the Dude Ranch that are also present on the subject cabin include the wood casement windows, a prominent fireplace, porch blinds, concrete stemwall foundation, and sheet metal roof. Log cabins are a rare architectural style in Sarasota County and only two known examples exist, including the subject cabin. While the cabin is not an example of pioneer construction, it is an example of the back-to-nature movement of the 1930's. The use of native trees, lumber, shell and stone links the structure to the land and embodies organic architecture. The cabin is one and one-half stories in height and is rectangular in shape. The gable roof was oriented north - south, with the entrance porch facing north. The cabin was located adjacent to the shore of Little Sarasota Bay, in a grove of mature live oak trees. The foundation of the cabin measures 20' by 28'. The foundation appears to have been constructed by forming the outside edge and filling the enclosure with two to three inches offine clean shell mixture. The material is not fossilized, but is crushed beach shell with fresh shell coloration. The material may have been excavated from the adjacent bay bottom, rafted across the bay from a nearby shell bank or transported to the site from the each. This type of material was also available from a commercial shell pit located on the southern tip of Siesta Key. This layer of shell was covered with felt roofing paper. An additional 2 to 3"of shell was added above the felt paper. A finish coat of cement concrete was applied and smoothed. A concrete stemwall 8" in height and width wraps around the perimeter of the entire structure, and provides a base for the first course of logs. The stemwall that separates the room from the porch included four steel bolts to secure the bottom half-round log. The stemwall is absent from door areas. Walls of the cabin are constructed of pine logs ranging in size from 6" to 10" in diameter, and from l' to 28' in length. A total of one-hundred log components were documented. Many of the logs reveal scars from historic turpentine harvesting associated with the early naval stores industry. These scars consist of a chevron pattern composed of angled furrows carved by weighted draw-knife style tools known as "hacks". The hack was used to slash the bark of pine trees to expose the cambium layer and promote the flow of sap. The sap was funnel into ceramic collection cups, which were nailed to the trees. These scars reveal a high resin contect in the adjacent wood. Log sections exhibiting turpentine scars are simply the section of log closest to the base of the pine trees cut for the cabin construction. A preliminary review suggests that all trees felled for cabin construction exhibited scars, and that logs without scars are simply the upper portions of the tree. Additional inspection of the cabin logs may reveal a precise number of trees utilized to construct the cabin. Additional study of the logs will provide an estimated age at cutting. Comparison with adjacent living turpentined trees will allow interpolation of a date for tree felling / cabin construction. It is likely that the trees were selected due to the high resin content of the turpentined trees. Most log components are in good condition with damage limited to areas adjacent to plumbing fixtures, and modern wood trim. Five walls enclose a single interior room and an open or screened porch. The log walls begin at the north, porch and south walls with a half log resting upon the concrete stemwall. The first course in the east and west walls is a full round log bedded in a cement mortar mix. Corner joints consist of a notch halfway through the bottom side of the log. This is a preferred log cabin construction method because it readily sheds water and exposes the entire end of each log to view. The logs were pinned with 8" steel spikes with round shafts and heads. The spikes were driven into the center of each corner joint. Ten courses of logs complete each wall. Window and door jambs were installed simultaneous with wall construction, as revealed by nails driven through the jambs and into the ends of the flanking logs. Nails were driven into the top of each of each log at an average interval of 2" to provide a secure hold for the masonry joint chinking material. Chinking consists of cement mortar applied to the exterior of joints of the walls. Two dates of chinking may have been present, or two styles of application were employed. The logs appear to have been treated with a dark stain finish: however, the date of this finish is unknown. One observation made during the removal of a modern porch addition was that the stain followed the addition. A modern addition also resulted in the removal and loss of several logs from the front porch. Only a single original vertical porch post remained, which may be used as a pattern for replacement of the missing components. The uppermost logs on the east and west walls are capped with rough sawn over-dimensioned 2"x 4" top plate which extend to the gable fascia. The ninth course of logs support a series of eight ceiling joists over the main room of the cabin. The joists are unpainted, rough-sawn, rotary milled, over-dimensioned 4" x 6" southern pine lumber. The ends of the joists rest upon the ninth course and are notched on top to receive the tenth course oflogs. During disassembly it was noted that the joist were not nailed into place, but were held in place by the weight of the tenth log and the grout chinking. The joists are oriented east and west and support an attic floor. The attic floor above the porch is framed with 4" x 4" pine smoothed on four sides. these joists run north and south, and are notched into the logs at each end. The porch attic joists and floor is 8" lower than the main attic. A hidden hatch of flooring material is located west of the chimney and provides access to the entire attic. The attic floor is constructed with 1" x 4" tongue and groove pine flooring. A single shallow groove along the center of each piece hints at a beaded effect. The floor is nailed to the joists below with 6d cut-nails. The ceiling side of the floor has been painted, while the upper floor side is unfinished and retains good color. The floor planking is laid north and south. The pine wood flooring is moderately dense. Items found in the attic include: masonite mortar board with dried chink material, two blocks for the window pulley system (one was lost), homemade bamboo fishing pole with two factory reel clamps, a leather "Bryan" pennant, and an single piece of 1" x 4" flooring. Twelve pairs of roof rafters rest upon the 2" x 4" top-plate and frame a 6 / 12 roof slope. The rafters are unpainted, rough-sawn, rotary milled, over-dimensioned 2" x 4" pine lumber. Gable end walls are framed with identical pine lumber, with a 3' x 3' opening for a vent window. Rafters are matched at the peak with no ridge board. Birdmouths distribute loads at the top-plate. During disassembly it was noted that a different nailing pattern was utilized on the opposing ends of each rafter, suggesting two carpenters at work, as would be typical on rafter installation. One pair of rafters is interrupted by the brick chimney, requiring frame blocking. Purloins are unpainted, rough-sawn, rotary milled, over-dimensioned I" x 4" pine lumber. Nine purloins are located on each side of the peak. Purloins are paired near the horizontal overlap of metal roof panels. Angled braces of purloin material were attached to the bottom edge of the roof rafters extending from gable corners. Gable ends are framed with over-dimensioned 2" x 4" pine lumber, and are clad with pine boards of random width laid in vertical board and batten style. Boards measuring approximately 1" x 6" are overlaid with alternating 1" x 4" boards. The rough sawn boards overhang the top one-half of the top course of logs. The window found adjacent to the south gable is a 2 light wood window. The window found adjacent to the north window is a 6 light wood window with three rectangular lights above three square lights. During disassembly it was noted that a cord and pulley system accessible from a hatch in the front porch ceiling may have been employed to open / close the attic windows. The roof consists of two layers of galvanized 5 V crimp metal roofing material. The first and likely original roofing is labeled" Wheeling Superchanneldrain", and is a heavy gauge panel 24" in width with pronounced "v" crimping consistent with the product name. The panels were attached with 2" ring-shank nails with lead heads. The second layer of roofing is modern, and of a thinner gauge steel. During documentation the attic was observed during heavy rain conditions and revealed no leaks. A formed steel ridge cap appears to match the original roof and may have been removed and replaced with the second roofing. The brick chimney is a prominent feature of the cabin and is located between the cabin room and the porch, along the central axis of the cabin. It is flanked by the entrance door on the east side and a window opening on the west. The chimney is constructed of red brick, and has a footprint measuring 5 ' x 3'. Buff colored sandstone approximately 1" thick is artistically applied to the fireplace face within the cabin. The firebox is lined with buff firebrick labeled" Kimberly". The base of the firebox is flush with the floor, with sandstone extending beyond the face of the fireplace. The' mantle is cast-in-place concrete with a simple yet attractive design. The mantle exhibited stress cracks and was removed in three pieces. The chimney accommodates two flues, the second one serving what is believed to be a previously removed cooking grill. Removal of modern paneling materials resulted in the discovery of the porch-side flue. Notes gathered will aid in the re-creation of an appropriate grill. The chimney is topped with a concrete cap with inward-tilted sides. Windows in the cabin are framed with wooden jambs and are hinged on the outside edge and are opened and closed with a geared crank mounted upon the sill. Wooden framed screens are located inside to allow the windows to open out. The southern wall has four windows 2' wide and 3' high with two paired in the center of the wall. The windows sills rest upon the fifth course of logs and the tenth log rests above them. The east wall has a pair of windows measuring 4.5' tall and 5.5 ' wide in total. The window sill rests atop the second course oflogs and supports the ninth course. During disassembly it was noted that a similar sized window was previously removed from the west wall and was replaced with a pair of French doors. A window opening west of the fireplace has no window present. Two door openings are original and one opening described above has been created from a former window opening. A fine quality wood panel door provides the primary access into the cabin from the porch. An opening missing a door is located along the west wall. A door discovered during disassembly is composed of T &G lumber and is consistent with the rustic nature of the cabin. In recent years the cabin has been occupied seasonally. When first observed, the cabin was equipped with appliances, furniture and assorted household goods. The structure was observed to be in good condition. During the life of the structure a number of additions and changes were made. A covered porch was added to the west side of the structure. A covered carport was added to the east side of the structure. Portions of the porch were removed to facilitate the expansion of the porch, which was simultaneously enclosed. A bathroom was installed in the southeast corner of the cabin, and a kitchen was installed along the south wall, with an island countertop free standing. The west window was removed and replaced with a pair of French doors. Print and slide photographs were taken prior to and during disassembly. Measured drawings were sketched and are being refined. All modern components were removed with care to protect original materials. Select wooden components including all logs, rafters and joists were coded with numbered aluminum tree tags.